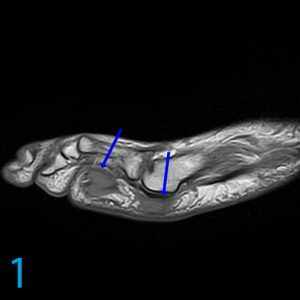 What matters in this 58-year-old’s foot case? This 58-year-old man has soft tissue masses in the foot. Let’s work through this case together, going through differential diagnoses from most to least likely. The abnormalities are indicated with blue arrows on image 1 (sagittal T1-weighted image without contrast), image 2 (sagittal proton density fat sat), image 3 (short axis T2-weighted image more proximally, highlighting a fifth-digit abnormality), and short axis T2-weighted image (image 4) of the more distal lesion. Your differential diagnosis should be influenced by the fact that this is a 58-year-old man, it’s a foot, the abnormalities are plantar in position and they are at least moderate in size yet do not destroy bone. Note the discrepancy in signal between the heavily water-weighted fat-sat image (image 2) and the standard T2 spin-echo images (images 3 and 4). Certain parts of the body have a predilection for certain disease processes, tumors and/or masses. For example, gout has a predilection for the great toe. Malignant fibrous histiocytoma has a predilection for the thigh. Your differential diagnosis should also be influenced by the striated internal architecture of the masses, especially on the short axis T2-weighted images. This should steer you toward the family of fibrous lesions. The broad categories of fibrous proliferation are benign fibrous proliferations, fibromatoses, fibrosarcomas and fibrous proliferations of infancy and childhood. Each of these categories has subtypes, and each subtype can be quite complex. As such, this is the longest case we’ve presented to date at ProScan. If you’re pressed for time, feel free to bookmark this page to read later. If you’ve got a few moments, I’d love to solve this case with you. The first two categories include non-aggressive fibroblastic lesions such as nodular fasciitis (less common) as well as plantar fibromatosis, which has a more aggressive biologic behavior and is considered by many to be a subset of the desmoid tumor. These lesions typically occur in the central cord superficial to the flexor digitorum brevis at about the mid metatarsal level from proximal to distal, and are analogous to Dupuytren’s contracture in the hand. Here, lesions are located in a more lateral distribution and are multifocal. Fibrous lesions typically have dense collagenous components so their T2 signal is low and striated. However, if the cellularity is great and/or there is swelling due to repetitive mechanical trauma against the ground (due to altered mechanics of weightbearing), then such lesions will be bright on heavily water-weighted fat-suppressed sequences, as in this case. Nodular fasciitis is a benign proliferation of fibroblasts and myofibroblasts and is often mistaken for sarcoma due to its rapid growth, numerous spindle-shaped cells and mitotic activity. This may be one of the most common benign mesenchymal lesions that is histopathologically misdiagnosed as a sarcoma with overly aggressive surgical therapy. It most likely is a reactive lesion that originates from trauma. Frequently, the trauma is unrecognized. Typically, the age range is 20 to 40; our patient is older. It also has a predilection for the forearm. Tenderness and pain are common. Three different subtypes have been identified, including subcutaneous, intramuscular or fascial, but invasion of the dermis and/or skin is rare and vascular invasion is rare. Nodular fasciitis may be myxoid dominant, cellular or fibrous dominant. In this author’s experience, nodular fasciitis or pseudosarcomatous nodular fasciitis has been mistaken for epithelioid sarcoma in the forearm pathologically on numerous occasions. A related disorder called proliferative fasciitis is another pseudosarcomatous lesion that is seen in patients averaging age 54, which is close to our patient’s age. Typically, this lesion arises in the subcutaneous tissues of the upper extremities and exhibits subcutaneous or superficial fascial growth, which may be fast. When deep, these are infiltrative-looking scarry lesions by MRI and are often misdiagnosed by the imager as well as the pathologist. This is another lesion that has been often confused with sarcoma, especially epithelioid sarcoma in the forearm. Fibroma of tendon sheath manifests as a slow-growing lesion in adults (mean age 31 years). Men are affected twice as often as women and the lesion is usually well-circumscribed and less than three centimeters. 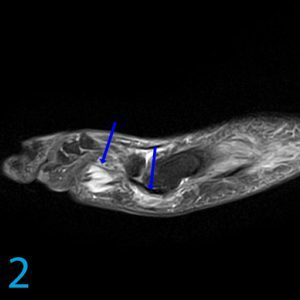 While the upper extremities are more commonly affected, this author has imaged innumerable fibromas of tendon sheaths involving the flexor tendon of the great toe. 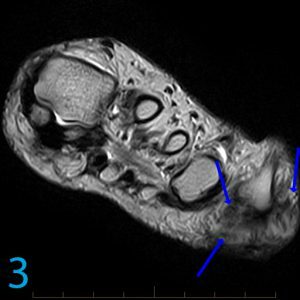 Some lesions (especially the ones in the great toe) show components of increased cellularity and myxoid change that make them bright, even on T2-weighted imaging. Some have proposed a relationship between this entity and giant cell tumor of tendon sheath. 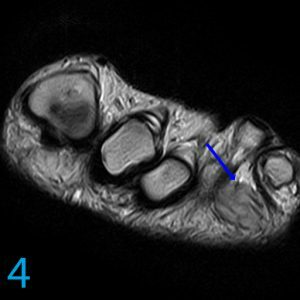 Association with the tendon of the great toe, sometimes even simulating a cyst or a ganglion, should be a tipoff to this diagnosis. Keloids and hypertrophic scars are benign fibroblastic proliferations arising from the dermis. They are mentioned here for academic completion only. Persons of African and Chinese descent have an increased risk for these fibrous lesions, which are rarely anything other than hypointense on MRI. They are far more common in the upper extremity. Elastofibroma is a reactive fibrous pseudotumor from chronic mechanical irritation with a genetic predisposition. Clonal chromosomal changes have been identified that suggest a fibroblastic neoplasm. Elastofibroma is slow-growing and almost always encountered in the posterior chest wall along the inferomedial border of the scapula in patients over 55 years of age. It has a definite predilection for women and is bilateral in 25 percent of cases. This author has never encountered one in the foot. Finally, we get to the fibromatoses. First, superficial fibromatosis or fascial fibromatosis and/or musculoaponeurotic fibromatoses are benign and have no metastatic potential. Still, their biologic behavior is somewhat aggressive with a high propensity to occur, and therefore resection should be considered with caution. The most common type of superficial fibromatosis is Dupuytren’s disease. Other superficial fibromatoses arise from fascia or aponeuroses at the plantar region, penile region (Peyronie’s disesase) and knuckle pads. Dupuytren’s disease affects the volar aspect of the hand, usually in patients over age 30, and occurs predominantly in men. Fifty percent of cases are bilateral. Flexion contractures especially affect the fourth and fifth fingers. Unlike the fibromatoses of the foot, which are often nodular, Dupuytren’s disease in the hand is more disc-like or flat. Plantar fibromatosis (Ledderhose disease) affects both children and adults but is more common in adults. It is bilateral almost 50 percent of the time. Men are more commonly affected than women by a 2-to-1 ratio. A strong association with palmar fibromatosis or Dupuytren’s disease is present. Unlike our case, most plantar fibromatoses are located in the middle to medial aspect of the plantar arch. Cytogenic studies have shown that chromosomal aberrations predispose patients to the disorder due to repetitive or recurrent trauma. In this author’s experience, the more aggressive lesions are larger, more atypically positioned (like these) and brighter on T2 spin-echo. EXCISE WITH CAUTION. Deep fibromatoses, which have a fibrotic band-like or tendon-like consistency, are also known as desmoid tumors. Some consider plantar fibromatosis or Ledderhose disease a non-aggressive or benign variant of desmoid tumor. Others segregate desmoid into the deep fibromatosis category as a distinct entity arising from the connective tissue and muscle, fat, or aponeurosis, most often in adults with an average age of 30. Deep fibromatoses are classified according to their intra-abdominal, abdominal, or extra-abdominal location. Most cases of mesenteric fibromatosis are sporadic, but some are associated with Gardner’s syndrome. Ten percent of patients with Gardner’s syndrome also have fibromatosis, which is typically intra-abdominal. These intra-abdominal desmoid tumors are usually located in the small bowel mesentery. Abdominal fibromatosis is a distinct entity that occurs in women during pregnancy and the first year after delivery in women who use oral contraceptives. This pattern of occurrence suggests that estrogen may be a factor in these fibroblastic lesions. The rectus abdominus and internal oblique are most frequently affected. This leads us to extra-abdominal fibromatosis, which usually arises adjacent to fascia in the muscles of the shoulder, chest wall, back, thigh and knee. These are large, rapidly-growing lesions that extend along muscle. They are usually solitary, but 15 percent are multiple. More aggressive lesions are seen in patients under age 20- you might hear the term aggressive fibromatosis used as a substitute. The appearance on MRI of desmoids varies with their age. Initially, they may be hyperintense on T2-weighted imaging and appear infiltrative with long tentacles. As time goes on, the collagen becomes more dominant and the lesions may progressively decrease in signal, leading to sense of security. Enhancement is usually moderate to marked with gadolinium. The striated appearance is seen here but also present in Ledderhose disease, where it can be more disorganized, less parallel. Your differential diagnosis is ultimately narrowed to the fibromatoses, both superficial and/or benign versus deep and/or aggressive. Because of the location in the foot, the patient’s age, and the relative lack of boundary crossing, you should favor the diagnosis of Ledderhose disease or superficial fibromatosis, which is the diagnosis in this case. For more case review, check out MRI Online.